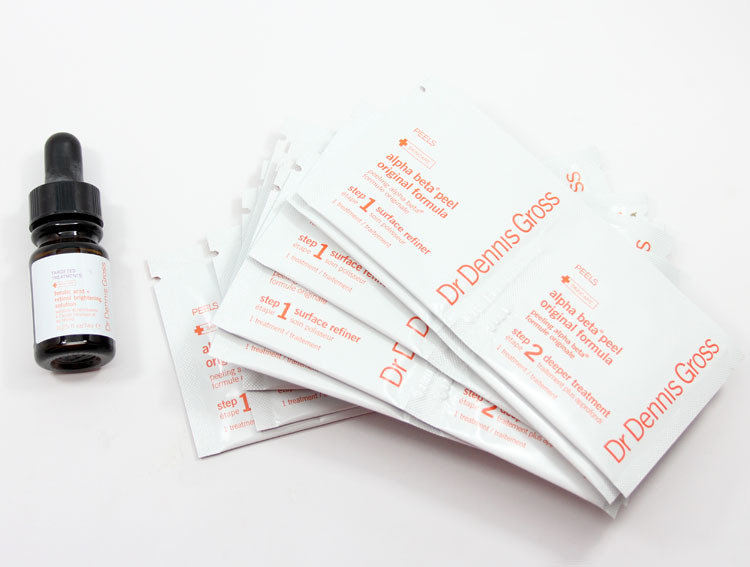 Over the last couple of weeks I have been trying out the Dr. Dennis Gross Alpha Beta Peel Original Formula 14 Day Challenge and the results were not what I expected. I’m always on the hunt for some kind of skin treatment that actually works. Or does something. Anything. I so very rarely ever notice a difference in my skin when using ANY anti-wrinkle treatment (including actual Retin-A) so I definitely wasn’t really expecting this stuff to do anything whatsoever. So what this is, is this: It’s a 14 day two-step face peel plan where you use the Step 1 pad then the Step 2 pad then a Ferulic acid + Retinol brightening solution afterwards. It contains a blend of alpha and beta hydroxy acids, which help your skin look younger and smoother. It’s supposed to help with fine lines, wrinkles uneven skin texture and enlarged pores. On day 1 you will experience smoother, softer skin as you apply it. For me this wasn’t really true. Yet. By day 3 your skin will appear healthier and more radiant. I still wasn’t really seeing anay difference by day 3. By day 7 hydration levels increase, texture improves for better makeup application. Ok now I can say I did actually start seeing some results. My skin was looking brighter and it definitely felt smoother. By day 10 pores appear smaller. Yep they really did. I don’t have huge pores to begin with, but they seemed tighter and less noticeable. By day 14 you will experience a reduction in the appearance of fine lines and wrinkles. I’m not 100% sure I saw this happen but I can say my skin did look better. It felt smoother by far and all my pores and uneven areas did look more smoothed out. My makeup went on more evenly than usual and I seemed a little more “glowy” than usual. They say that results will improve if you continue using them, so I just might pick up one of the 60-count containers. One thing to note. You can actually cut the pads in half to extend the use to be more like 28 days. I was going to do this but decided to use them on my neck and hands as well, so I used the whole pad. Overall I am rather liking these pads and feel like it did actually make a positive difference in my skin while I was using them. You can find this at Sephora or Dermstore and it costs $45.00. Have you ever tried a facial peel kit like this?